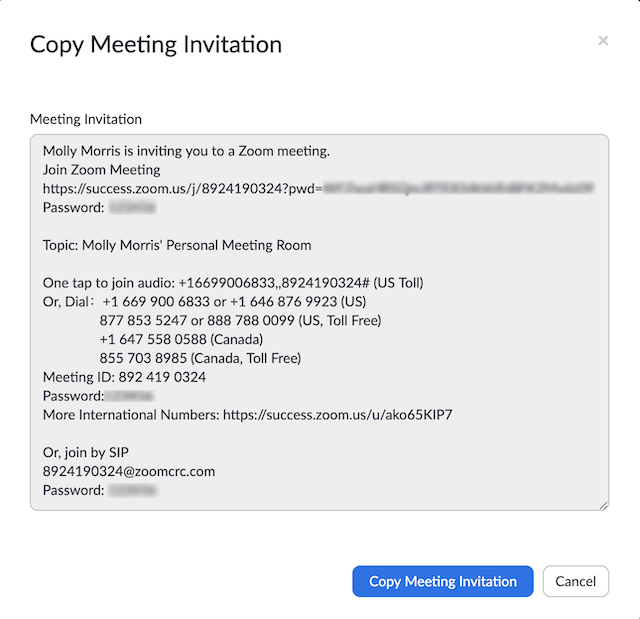 Zoom offers multiple methods to schedule a meeting. A host has control over the options for their scheduled meetings except for settings that an administrator has locked for all users in the account or for all members of a specific group. Open your Zoom client and sign in to Zoom. Topic: Enter a topic or name for your meeting. Duration: Choose the approximate duration of the meeting. This is only for scheduling purposes. The meeting will not end after this length of time. Time Zone: By default, Zoom will use your computer's time zone. Click the drop-down menu to select a different time zone. Recurring meeting: Choose if you would like a recurring meeting (the meeting ID will remain the same for each session). Host: Choose if you would like the host video on or off when joining the meeting. Even if you choose off, the host will have the option to start their video. Participant: Choose if you would like the participants' videos on or off when joining the meeting. Even if you turn off, the participants will have the option to start their video. Audio: Choose whether to allow users to call in via Telephone only, Computer Audio only, Both, or 3rd Party Audio (if enabled for your account). Mute participants on entry: If join before host is not enabled, this will mute all participants as they join the meeting. List on Public Event List: Post the meeting on the public meeting/webinar list so that anyone can view it. We recommend you add a meeting password to secure your meeting. Schedule For: If you have scheduling privilege for another user, you will be able to choose who you want to schedule for from the drop-down menu. Calendar: Select a calendar service to add the meeting to and send out invites to participants. Click Schedule to finish, and open the selected calendar service to add the meeting. If you are scheduling a recurring meeting, you will need to set the recurrence in your calendar service. Choosing Other Calendars will allow you to copy and paste the scheduled meeting information such as date, time, and meeting URL. Sign in to the Zoom web portal at My Meetings, and select Schedule A Meeting. Time Zone: By default, Zoom will use the time zone set in your profile. Click the drop-down menu to select a different time zone. Recurring meeting: Check if you would like a recurring meeting (the meeting ID will remain the same for each session). This will open up additional recurrence options. Audio Options: Choose whether to allow users to join using Telephone only, Computer Audio only, Telephone and Computer Audio (both), or 3rd Party Audio (if enabled for your account). Dial in From: If Telephone or Telephone and Computer Audio is enabled for this meeting, click Edit to select the dial-in countries that you would like included in the invitation. By default, this includes your Global Dial-In Countries listed in My Meeting Settings. Enable waiting room: Allows the host to control when participants join the meeting by placing them in a waiting room. Only signed-in users can join this meeting: Restrict access to the meeting so that only signed-in using can join. Default to HD Video: If you enable this option, the participant view will always default to HD video automatically (if the feature is available in the Account Settings). Sign in to your Zoom application, then select the Schedule icon. Select the options for you meeting. Some of these options might not be available if they were disabled and locked to the off position at the account or group level. Audio Options: Choose whether to allow users to call in via Telephone only, Computer Audio only, Both, or 3rd Party Audio (if enabled for your account). Note: Choosing Other Calendars will allow you to copy and paste the scheduled meeting information such as date, time, and meeting URL. Select the meeting options. Some of these options might not be available if they were disabled and locked to the off position at the account or group level. Date, From, To: Select a date and time for your meeting. Time Zone: By default, Zoom will use your device's time zone setting. To change the time zone, click this field. Repeat: Choose if you would like a recurring meeting (the same meeting ID for all occurrences). Host video on when starting: Choose if you would like the host video on or off when joining the meeting. Even if you choose off, the host will have the option to start their video. Participant video on when joining: Choose if you would like the participants' videos on or off when joining the meeting. Even if you choose off, the participants will have the option to start their video. Pick your audio connection: Choose whether to allow users to call in via Device audio, Telephone, or Both. 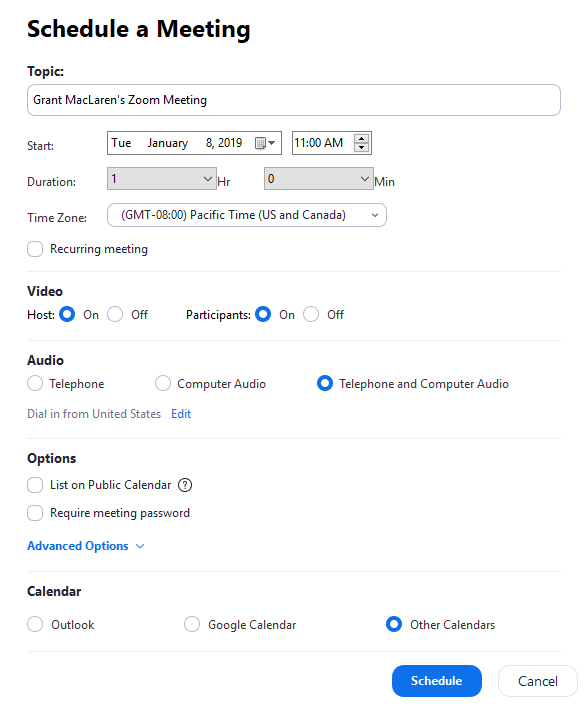 Select dial-in country: Select dial-in numbers to display in the meeting invite. Tap and drag each country to re-arrange the order. Meeting password: Enter a password that participants will be required to input before joining your scheduled meeting. Allow join before host: Allow participants to join your meeting before you. The meeting will end after 40-minutes for Basic (free) users if 3 or more people join the meeting. 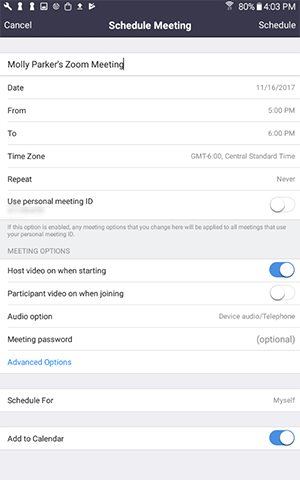 Record meeting automatically: Check this if you want the meeting to be automatically recorded. Record location: Select if you want it to be recorded locally (to your computer) or to the cloud (zoom.us/recording). Alternative hosts: Select users in the same organization to allow them to start the meeting in your absence. Read more about Alternative Host. 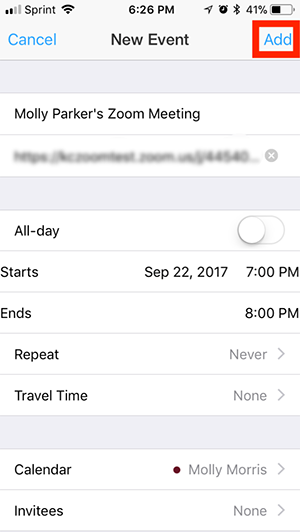 Add to Calendar: Add the meeting to your default calendar app. Log in to the Zoom app on your iOS device. Repeat: Choose if you would like a recurring meeting (meeting ID will remain the same for each session). Host Video On when starting: Toggle on if you want the host video on by default when joining the meeting. Attendee Video On when joining: Toggle on if you want the attendee video on by default when joining the meeting. Audio Option: Choose whether to allow users to call in via Device audio, Telephone, or Both. Advanced Options: Click to view additional meeting options. Record the meeting automatically: Check this if you want the meeting to be automatically recorded. A non-recurring meeting ID will expire 30 days after the meeting is scheduled for. You can restart the same meeting ID as many times as you would like, within the 30-day period.